5Dimes Offers an Enormous Range of Sporting Events! 5Dimes Customers Can Choose their Type of Sports Betting Account! 5Dimes offers several types of sports betting accounts, each with different player incentives, such as a welcome bonus or reduced juice. Pick the type of incentive that suits you best! New Players can choose to receive the 50% plus deposit bonus to be used in the 5Dimes Sportsbook. You must contact Customer Service to opt into this promotion! Receive a 50% bonus on your first deposit for up to $200. Deposit more than $400 and receive an additional 20% bonus! Read our full 5Dimes Sportsbook review and details on the 50% Plus New Player Reward bonus. By default, all new players are put on the Reduced Juice Rewards program. Instead of the standard pricing of -110 to win 100, the Reduced Juice Rewards program offers -105 bets to win 100 on the day of the event. That’s a 50% discount on the costs placed by the sportsbook, but not all events and sports offer reduced juice bets. A third alternative for new 5Dimes is players is to opt in to the up to 20% Cash Back Reward program. Players must contact customer service and have their account converted to a Cash Back Reward account. Then, you may request a 20% cash back reward on all your overall losses twice a year, a 15% cash back reward once per 30 days, and a 10% cash back reward once a week on Tuesdays. The 30% Super Saver Reward is a fourth option available to new 5Dimes customers and must also be manually opted in by contacting Customer Service. The 30% Super Saver Reward reduces bets from the standard -110 to win 100 to -107 to win 100, effectively reducing the juice from 10% to 7%. 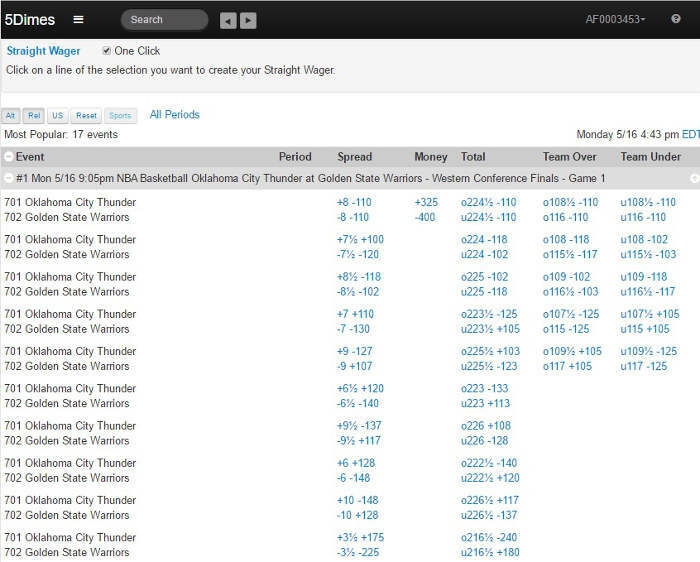 In addition to this 30% fee reduction, this plan also provides expanded parlay payouts. In addition to the widest range of sporting events available online, 5Dimes also offers In-Game betting options, Reduced Juice bets, and their DynamicLines features which shows real-time updates to current betting lines. To access the DynamicLines screen, log in to your account and then find the DynamicLines link at the top left corner of the screen. When playing at 5Dimes, there is a 50¢ minimum bet and $50 minimum deposit. 5Dimes is one of the top online sportsbooks servicing USA players and has a strong reputation of offering great odds and prices to sports bettors. Visit 5Dimes today and set up the type of account you prefer. Click here to open your account at 5Dimes!